After four sets featuring only players from the four American-based NHL teams, there was a change in the 1960-61 Topps hockey set. The Detroit Red Wings were dropped from the set as Parkhurst claimed them for their own hockey set. For the rest of the time that Topps and Parkhurst competed, they would split the NHL at three teams apiece. 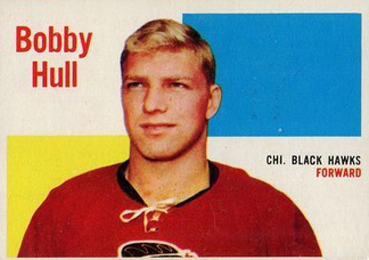 1960-61 Topps Hockey card fronts feature a player picture superimposed against a background that has been divided into four blocks. Two of the blocks are white, and the other two are mixtures of red, yellow or blue. The team name and position appear above the player, while his name is below. Some cards are oriented horizontally. Card backs are printed in orange and have a change from previous hockey designs. For the first time ever, the base cards have no player biographies. The upper left corner has a box that contains the card number, with the player's name stretched out across the card. Below that is the player's team and position, followed by a single line of statistics from the previous season. Most of the rest of the card has a cartoon with a general trivia question printed in both French and English. The answer could be discovered by placing a red paper that came inside the packs over the question. 1960-61 Topps Hockey has players from the Chicago Blackhawks, New York Rangers and Boston Bruins, as well as 26 cards of players from the sport's past. These All-Time Greats cards feature a player superimposed on a golden sun, as well as vertical red and blue stripes. Interestingly, they have short biographies on the back. The most important rookie in 1960-61 Topps Hockey is Stan Mikita.